Always good to hear from the Despair Depot. Sorry to hear of your ailments, earache is horrible, it can be a real pain in the ... oh, yeah, you know. Hope it's all fully cleared up soon. Heartily seconded! I do hope that you're now fully recovered and it never reoccurs. 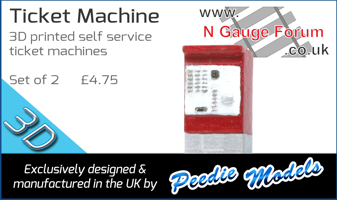 I particularly like the way you restore the old Minitrix diesels to new lease of life. I sympathise Gideon. I have twice had an ear infection - not pleasant! However, Louisa liked it - she got to put the drops into my ear. (I think she has a sadistic streak deep down ). I hope things are improving. More "proper" work will be displayed soon! You're absolutely right about the 4F! I'd been thinking it looked a bit odd and I couldn't put my finger on why... I'll add the handrails (and on the tender, too) - should look great then! Sorry you've been unwell, Gideon. That sort of pain can knock the stuffing out of you. Hopefully you're on the mend and getting back to doing some of the things you do so well. Aaaaaand…. after a slight whirlwind of illness, work, children etc... I'm back where I belong at the workbench! 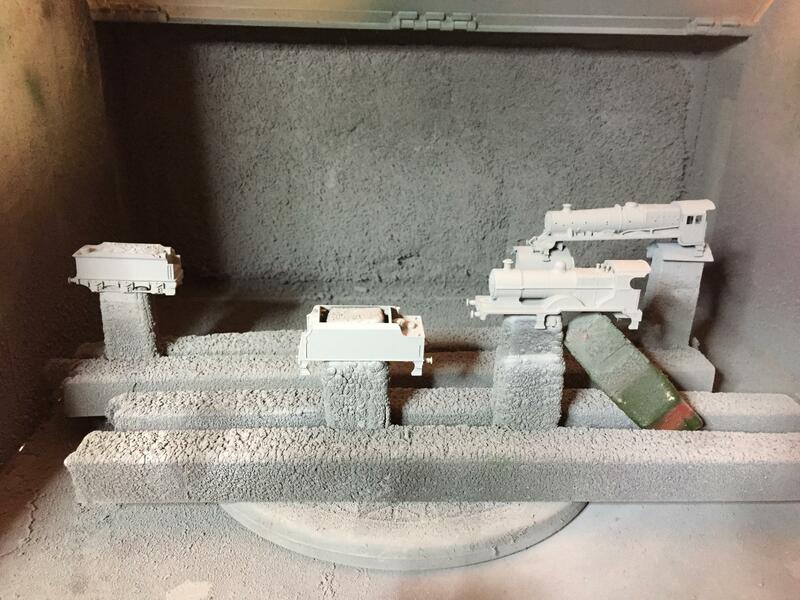 A 2P and a Jube looking rather ghostly in the spray booth (@emjaybee - the Jube is one of yours!!! ) They're both a lovely satin black now. The N7 is very nearly complete - just need to get the rear axle sitting right to stop it derailing everywhere! 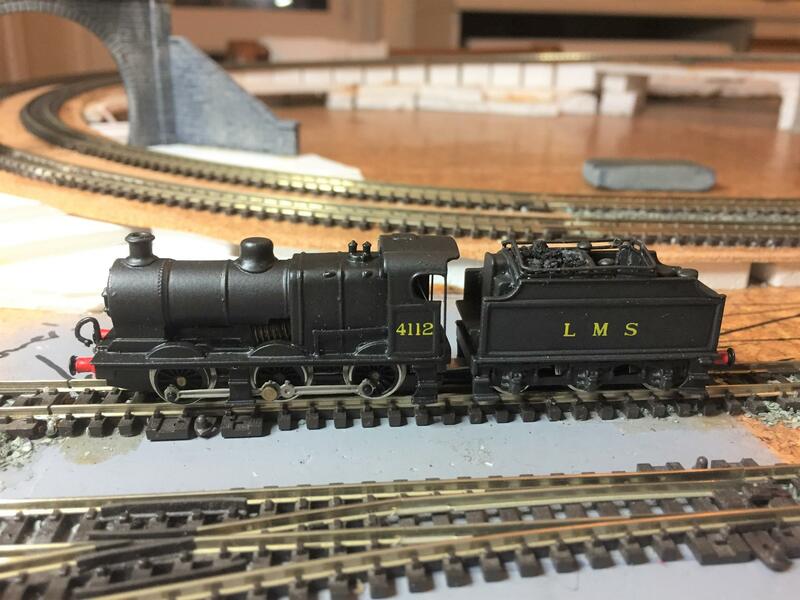 A Minitrix 2-6-0 Ivatt bodyshell completed - just needs a chassis! Much, much more on the go - I'll try and get some pics tonight! Always good to see your work, even better when I've got a vested interest in one. Very exciting when you know that there's another one not far behind. I know you're going to LOVE doing the lining on this one and the next, so I'll pipe down and let you concentrate. Great to see some pics, that little N7 looks great. 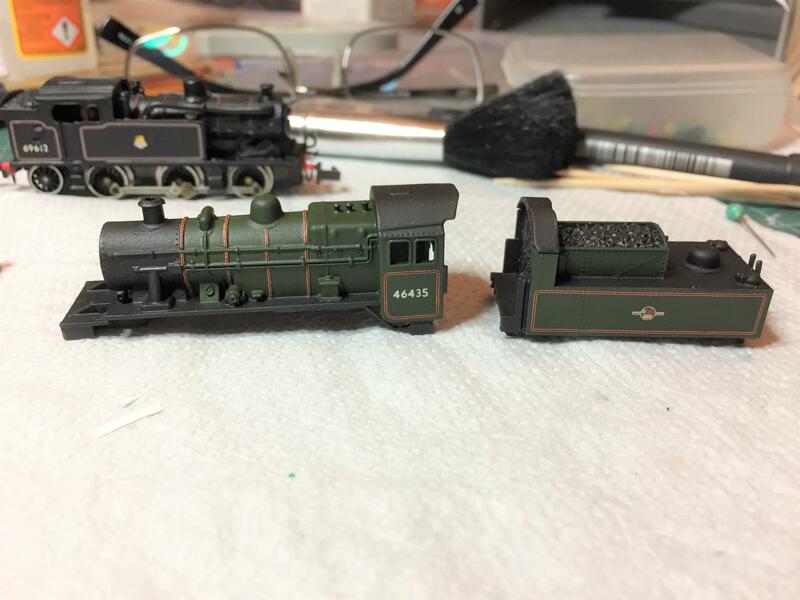 That Minitrix Ivatt is truely outstanding. I did a real zoom in and I can’t believe that isn’t Factory Finish. I wish I could say that there's a magic trick to it, but there isn't... I just strip the shell back (normally in brake fluid), clean off with kitchen cleaner and a toothbrush and pick out any stubborn bits of paint with a pin/cocktail stick. Then I give it a coat of primer (Halfords grey, or red if it's a maroon livery), followed by an airbrush coat of the base colour. 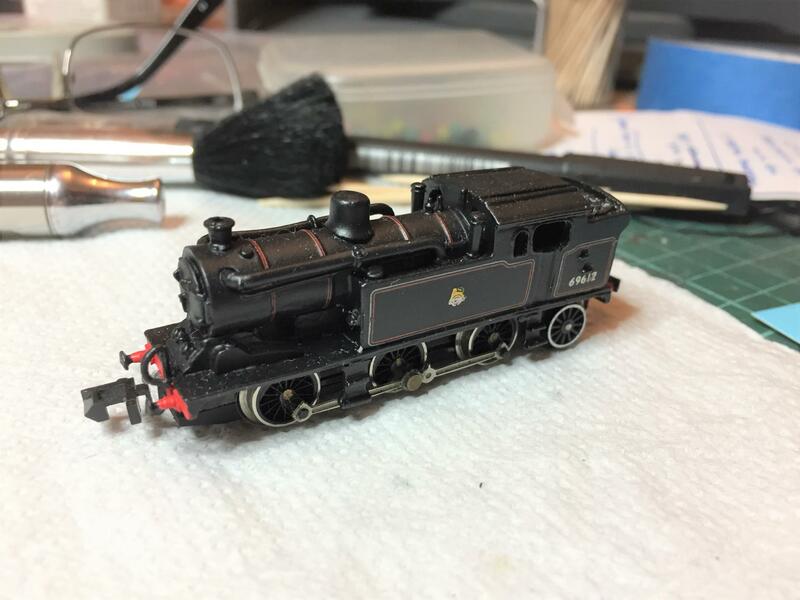 Black details (smokebox, roof etc) I brush paint with thinned Humbrol satin black - -a drop of IPA in this helps minimise brush marks - normally two coats will cover the base colour. If the base is matt/satin I then airbrush on a coat of thinned gloss varnish to help the transfers adhere properly. The lining/numbers go on next, followed by two thin coats of satin varnish (normally applied fairly quickly one after the other, before it dries properly) - et voila! The Black Motor is done! I just need to pop it back on its chassis, so I'll try to get a pic tonight.